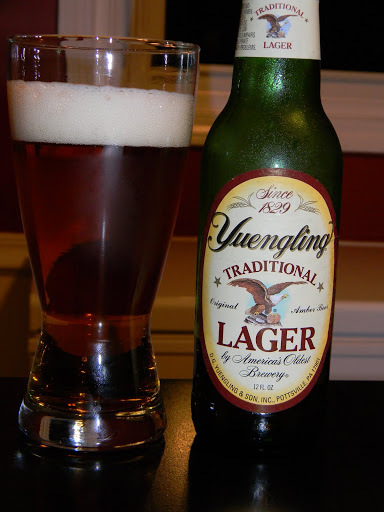 Yuengling | Beer Apprentice - Craft Beer News, Reviews, Interviews and Info. Today, I’m going to review a beer from the oldest brewery in America. The Yuengling Traditional Lager produced by the Yuengling Brewery in Pottsville, Pennsylvania. They also have a brewery located in Tampa, Florida. I, personally, have never tried this brew. Some speak highly of it…. others not so much, so I’m able to go into this completely unbiased. I found on the website, yuengling.com, that they have a very storied history and brew several different types of beer. The Traditional Lager is regarded as their flagship brew and here is the description I found. An Iconic American Lager famous for its rich amber color and medium-bodied flavor – with roasted caramel malt for a subtle sweetness and a combination of cluster and cascade hops, this true original delivers a well-balanced taste with very distinct character. Let’s see how good it is, shall we? This beer has an ABV of 4.4% and comes in a standard 12 oz. bottle. The appearance was a clear, burnt orange/copper color with a fizzy, soapy looking, white head. It poured to a decent size, but it only had average retention and only left behind small traces of lacing. The aroma had a slightly sweet, caramel malt fragrance blended with a touch of grain and a bready/cracker type of smell. The overall aroma was restrained and diluted a bit I thought. After the beer warmed, it developed a “stale” quality that wasn’t really off putting or putrid, but rather dull and bland. Like it wasn’t real fresh or something. Heck, I don’t know. I didn’t find any real hop character in the bouquet either, but it still smelled ok enough to drink. The aroma seemed to be balanced well, however it was just a wee bit relaxed and uncomplicated. The taste brought out more of the grain-“y” flavors while the caramel malt was pushed to the side. A crisp cracker and a light, lemony citrus tone gave it a bit of snap. The flavor, like the smell, was a touch mild and diluted in hop character and overall complexity. I wish the caramel could have been more forthcoming and dominant because the sweetness was really dialed down in my opinion. The mouthfeel was medium to mostly medium/thin. It was smooth, crisp, refreshing, thirst quenching and a tad bit watery. Not much flavor was left on the palate. It vanished pretty quickly to tell the truth. Well…. My first experience with the Yuengling Traditional Lager was mixed. It wasn’t anything bad nor was it anything extraordinary. Right down the middle for the most part. It had some excellent qualities, like the crispness, ease of drinkability and the thirst quenching capabilities, however I also thought that the aroma and taste were a bit subdued for my liking. This brew is still a step above any “macro” and would be perfect for a BBQ cookout on a blistering hot day. I think it would be best served ice cold also. Turn it up and drink!!! Too me, nothing horrible. Just an average, decent, gateway lager. Would I drink it again? Sure. I could down a few with ease. What do you find to be the best brew for cookouts? Does the Yuengling make your list?